ScheduleFM Athletics gives athletic directors and administrators an efficient way to schedule sporting events, book facilities, line up resources, and manage all the related tasks and communications, easily and cost-effectively. Arrange home or away games, practices or scrimmages for all levels and both genders, and notify officials with ScheduleFM Athletics. Select from a list of league or non-league opponents, 1 on 1 or tournament play. Scheduling an event can be done in concert with booking available and appropriate facilities, arranging transportation and notifying coaches, officials, security and maintenance staff for game day help. 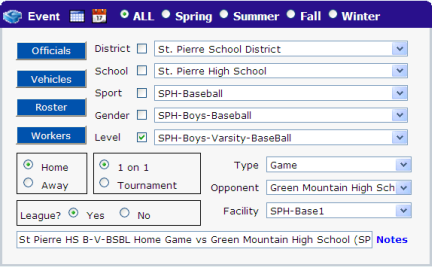 The integration of athletic and facility scheduling using a common interface reduces work, eases communication, and provides timely and accurate information to users inside and outside the school. 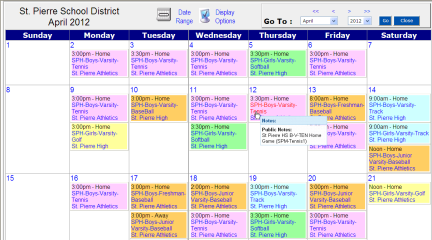 A centralized league calendar provides public access to event information, along with scores and league standings.